Myxedema coma is a decompensated state of severe untreated hypothyroidism. It is an endocrine emergency. This article will focus on its definition, clinical features diagnosis and management. Graves ' disease was diagnosed in a patient in the community . 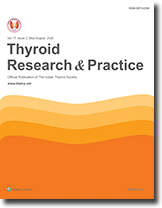 Clinical and biochemical thyrotoxicosis persisted on anti thyroid drug (ATD) Carbimazole treatment and thyroid function tests showed inappropriately normal TSH with raised free T' and free T . After methodological interferences were ruled out, TSH-secreting pituitary adenoma or thyroid hormone resistance was suspected. After further biochemical and radiological investigations including free alpha glycoprotein subunit (SL-GSU) measurement and MB! scan of brain a diagnosis TSH secreting macro adenoma was suggested. She underwent debulking surgery and immunohistochemical staining confirmed a benign pituitary tumor with positive staining for TSH and Luteinizing hormone (LH). She received pre and post operative octreotide injections. Post operatively pituitary radiation treatment was given with which her disease had stabilized and she had marked clinical and investigational improvement.